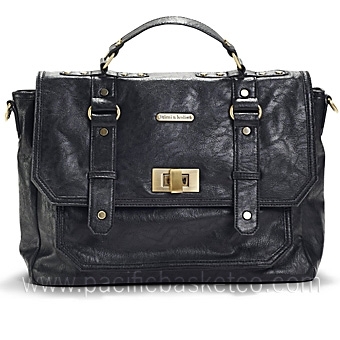 A sleek, sophisticated mama like you will feel stylish and organized with the Casey Bag. 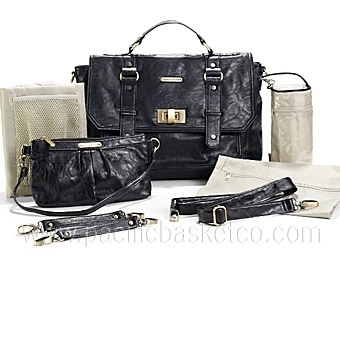 It's made from faux leather (PVC free) and features custom hardware in an antique brass finish. Casey comes with many functional and fashionable accessories and features a cross body, adjustable detachable strap so you can wear it hands free whenever you need to. Our specially designed changing pad with a front mesh pocket where you can store your diapers, wipes and creams when you need to make a quick diaper change trip. Water resistant, light colored lining so you can easily see everything in your bag. Two exterior side pockets, six interior organizational pockets and an inside key fob. • A stylish clutch that you can use as your purse with interior credit card slots and an inside zipper pocket. • An insulated bottle tote to keep your baby's bottles warm or cool. • Matching stroller straps so you can hang your bebe bag from your stroller.